GRIT Obstacle Training Birthday Parties for kids! 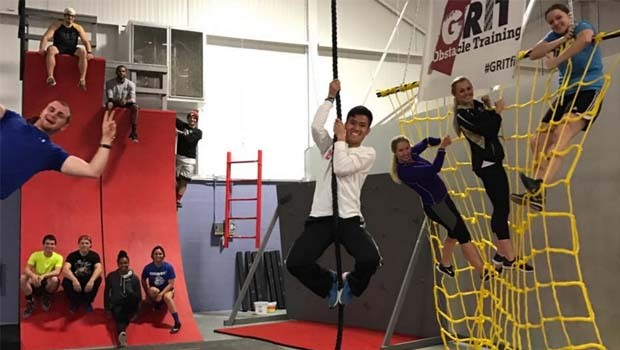 If your kids LOVE American Ninja Warrior, they’ll LOVE parties at GRIT in Rochester Hills. Indoor obstacle courses aren’t just for adults, kids have A BLAST on them! GRIT’s obstacle Training course is better than any playground your kids see at school. GRIT Obstacle Training Birthday Parties are 2 hours in length and feature 55 obstacles in 5000 Sq ft at the awesome GRIT training facility. Kids will have the opportunity to play on obstacles like, Devil Steps, 3 Warped Walls (10ft, 12 ft and 14.6 ft) – regulation Ninja Warrior height, Balance obstacles, Cannonball Alley, Salmon Ladder, Quint Steps, Vertical Walls and much more. Party professionals run them through relays and competitions and then allow time for open obstacle play to ensure they are nice and tired! The party doesn’t end on the obstacles. Party goers will have access to the reception area where you can bring food, cake, drinks, etc. GRIT has had THOUSANDS of people through their doors in the last 7 months since they opened and have held hundreds of birthday parties! Come join GRIT for the “Ninja” experience! Call GRIT Obstacle Training Today to book your child’s next party! GRIT Obstacle Training also offers FUN summer camps!